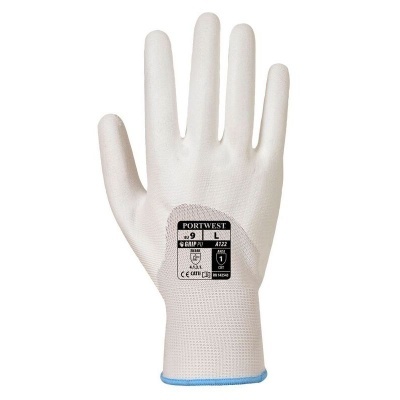 Fitted with a flexible liner to boost their performance, and dipped in a polyurethane coat, the Portwest 3/4 PU Dipped Handling White Gloves A122WH are perfect for general handling applications. They offer not only maximum levels of abrasion and tear resistance, but high levels of comfort and dexterity as well. The Portwest 3/4 PU Dipped Handling Gloves A122WH are available in six sizes, one of which should suit the hands of most users. Please measure the circumference of your hand around the knuckles (excluding the thumb) with your hand open and your fingers together, and the length of your hand from the tip of your middle finger to your wrist.